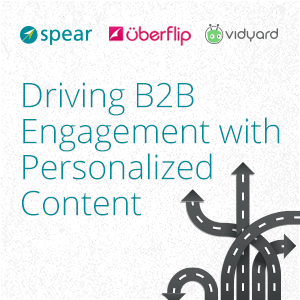 Earlier this month I co-hosted a Webinar with Greg Kelly of Vidyard and Jason Oakley of Uberflip on “Driving B2B Engagement with Personalized Content.” During the event, we discussed trends driving the interest in content personalization, addressed some of the key challenges, and presented examples of B2B companies having real success with their personalization strategies. You can view the recorded version of the event here. Marketing content is devalued. Successful content today is about Value, not Volume. Content personalization maximizes the relevancy, and therefore the effectiveness, of marketing content by making an ad, an email, a Web page or a content asset personally relevant to the target individual. Know your audience and your message. Define segments and buying personas. Define messages and value propositions for those segments (i.e. a message deck). If you don’t know what’s relevant to your audience, no amount of personalization will help. Personalization doesn’t have to mean creating all new content. Take stock of what content you have and map it against defined segments to identify content “gaps”. Look for core content such as white papers that can be “sliced” into multiple assets and versioned more readily for specific industries, roles, etc. Personalization has a myriad of potential use cases proven to generate engagement – display ads personalized to a specific account, personalized video in a sales outreach email, Web pages that generate real-time content recommendations based on a visitor’s profile or behavior. Plus personalization opens up new ways to score or qualify leads, for example: a lead score based on leads that watch 80% of a personalized video. Personalization can have different performance metrics depending on the channel and type of content. But measurement is key to proving success and ROI. Look at basic engagement metrics (opens, clicks, conversions) but also how long people engage with content (average time per page visit, or percentage of video watched), or even how many people reply to an email (because they perceive the communication as more “human”) vs. simply clicking on a button. To view the Webinar, “Driving B2B Engagement with Personalized Content”, click here. This entry was posted in B2B Marketing, Campaign Strategy, Content Development, Content marketing, Webinars and tagged ABM, B2B Marketing, b2b marketing agency, content development, Content Personalization, Personalized Content, Uberflip, Vidyard on November 22, 2017 by Howard Sewell. I find businesses jump in on personalization without having a strategy in mind. Either buying complex tools but never fully using them, or jumping in at the deep end and trying to personalize everything. A phased approach with a longer-term vision would be my recommendation.